According to the National Association of Fleet Administrators, 50 percent of all accidents are preventable. The cost of operating motor vehicle fleets is escalating rapidly — whether a company manages automobile fleets or large tractor-trailer units. Safety data reveal that in many fleets accident frequency and severity are increasing. As a result, companies are faced with high insurance premiums and other direct and indirect costs — including the costs of physical damage, property damage, workers’ compensation, and medical expenses. What Will You Say When They Ask What Happened? ⇒ How can I eliminate or reduce accidents? 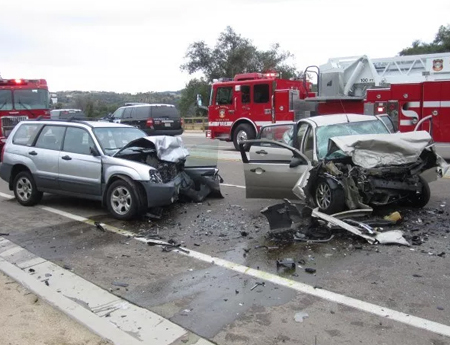 ⇒ What factors contribute to the frequency and severity of accidents? ⇒ Does my company have an effective fleet safety program? ⇒ Are my ongoing safety training programs effective? ⇒ Is there a manual that outlines company policies and procedures for drivers and operational personnel? ⇒ Vehicle Records (MVRs), at the time of hiring and then periodically thereafter? Whether you are managing the auto fleet for a field sales force, maintenance vans for installation or repair work, or tractor-trailers hauling goods from coast-to-coast, FleetWatch Systems Driver and Fleet Monitoring program has the solutions and resources to help you identify, assess, and address your risks. Our Driver Monitoring Program is the first step in the process. The program serves as a risk management component in your fleet. Information on your drivers operation habits are gathered through our vehicle observation reports, reviewed, and discussed –consulted with your drivers regarding the issue at hand. After your incident review with the driver, a report of action taken or evaluation measures are reported back to us for review. The final analysis is delivered with specific recommendation as to which element, i.e., driving stress management, time management, safety courses, defensive training, or re-evaluation programs, will have the greatest effect on your driver, business and help mitigate any possible loss costs. DriverMonitoring- Maintain an on-going driver evaluation by monitoring his/her driving habits. Training — Educate new employees on safety protocols and defensive driving techniques, continually update the skill sets of veteran employees. Injury Avoidance - Evaluate existing work processes and environment, improve work methods and workflow as part of a pre-loss safety program. Management Involvement — Develop processes to actively involve senior management in the effort to reduce loss costs, demonstrate management’s commitment to employees. Accident Prevention — By implementing a driver monitoring program you can identify the high at risk drivers. Develop quality defensive driving programs based on best practices. Cargo Security — Improve cargo securing methods to help reduce the likelihood of injury to drivers and cargo handlers. Driver Involvement — Implement programs that involve drivers in safety committees, accident reviews, and lead-driver preparation. Driver Recruitment — Review current hiring procedures and policies and deliver specific recommendations, i.e., incorporate MVR reviews into the hiring process. Driver Retention — Identify job dissatisfaction and other morale issues, develop appropriate employee retention programs. Fleetwatch Systems 1-800 HowsMyDriving also provides workshops via the internet. Online classroom training is combined with behind-the-wheel exercises, which include controlled braking, off-road recovery, evasive maneuvers, handling dry and slippery curves, skid control, jackknife recovery (truck-specific workshops), etc.